A private investigator commonly known as a PI and informally known as a private eye, inquiry representative or a private detective, is a person who can be appointed by personages or groups to commence investigatory law services. Investigators or Private detectives regularly work for attorneys in civil cases.Private investigators play a very significant role in assisting individuals, corporations, and law enforcement agencies. Their job is to help find missing persons or perform research for financial, legal, or criminal investigations. As a private investigator, you can choose to work for businesses, attorneys, and private citizens or you can decide to open your own organisation.One of the chiefduties of a PI is research. You may possibly be researching family history, legal records, piloting a computer search to research about a crime or conduct a circumstantial check on a job applicant. After you have completed your research, you will evaluate the facts to find appropriateevidence for solving a case. The information-gatheringprocessincludesquestioning people to collectthe requiredevidence. These people could be relations of missing individuals, someone who has observed a crime or has other pertinentevidence. With the help of these interviews combined with your own research, you collectthe proofs to resolve a case or present court evidence. The Private Investigator certification course explains all about the responsibilities and duties of a private investigator and the possible situations and circumstances they may have to deal with. The main role of a private investigator is, often sometimes, much more difficult than it appears to be initially. Private investigator jobs involve everything from undertaking legal issues and financial disagreements to providing cessation for clients concerning personal matters. A PI requires excellent observational skills. Correct knowledge of the law and honest are very important in this field. Some private investigators identity theft, cyber harassment, and copyright violations.They are frequentlyappointed by people to investigate if their spouses have committed betrayal. Private detectives exploit many investigative techniques. They largely use computers to trace deleted e-mails, discover documents, and run database examinations and searches. PIuse computers to look for information about motor vehicle registration, telephone numbers, criminal records, and court judgments. Brainmeasures is an ISO certified leading professional online certifications company renowned for their professional online certifications and skill testing. After getting enrolled in this course, you would receive an E-book that would guide you for the online exam. Upon successful completion of the exam, you would be awarded the certificate by Brainmeasures. The average salary of a Private Investigator is around $50,780 - $80,000. Salaries may vary depending upon the personal experience and qualifications of an individual. Teaches you about the making of a PI. How to follow the path in order to become a successful PI. Discusses the various tools of the PI trade. Knowing What Names to Use in Your Search& getting to the Root of Nicknames. Guides you with important steps like going to the court and accessing courthouse records. How to get professional PI databases quickly and efficiently. How to know telephone secrets and verify nonpublished numbers. Discusses about on the job training and techniques of interview and interrogation. How to perform investigation in the neighbourhood. Carrying out stationary surveillance and moving it. Discusses about the various tricks of the trade and checking out from any information from the trash too. How to sort out family law cases. How to bring runaway teenagers home. Teaches you all about electronic surveillance. How to solve criminal defence cases. How to carry out background investigations and uncover the dirt. Check with the regulatory agencies and families and relatives to know the reality. How to sift through the evidence, reports, statements and bookkeeping. Discuss all at the Judge’s chambers and work product from the Attorney’s office. 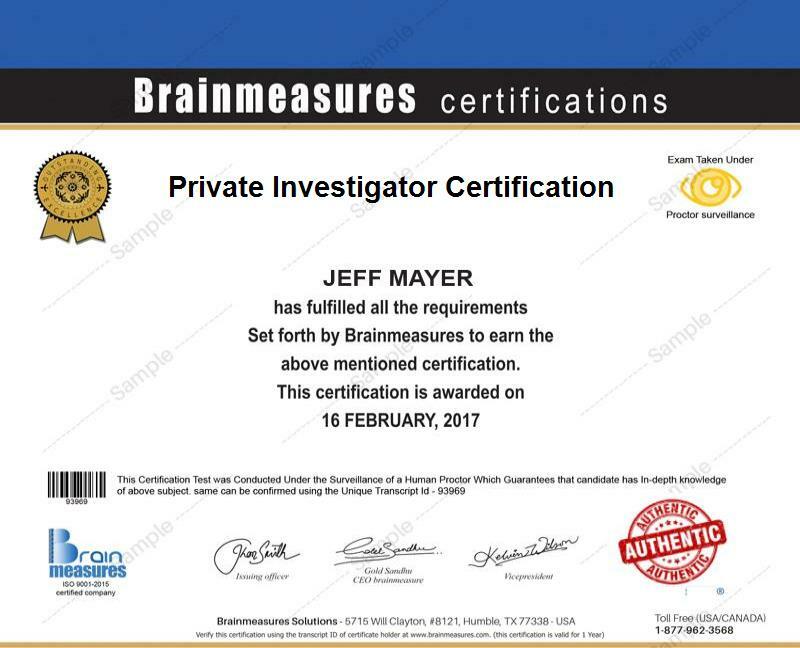 The Private investigator certification course by Brainmeasures is really beneficial for all those individuals who aspire to become successful PI’s and have a deep interest in learning this subject in depth in order to gain the required understanding, skills and expertise. Certifications by Brainmeasures are recognized and accepted worldwide and hold a high significance. They are an added benefit in getting recruited in an established organization since after becoming a certified professional PI, it is much easier to get employed with a reputed firm and achieve success in your career. These days most of the businesses and individuals look forward to hire professional qualified PI’s for solving their legal cases.